Gun safes today in many ways have become like automobiles. Each manufacturer offers unique features, attempting to make their product appear different from the rest. Aside from the advertised product features, very few talk about what they will do after a sale has completed. Unfortunately, over time many consumers pay more than the original purchase price of the safe.. While many policies sound complete, they often do not cover drilling a safe open or shipping the safe cross country for repairs after a Burglary, Fire or Natural Flood disaster. Services such as this can cost hundreds. Pentagon and Cannon Safe are manufacturers to offer our customers a ZERO COST – Lifetime Replacement Policy **. Who pays for a safe tech to open the safe? Who pays for the safe to be repaired onsite at your home? Who will pay the freight to the factory and back for repairs? Cannon Safe offers an industry leading warranty that includes a lifetime replacement policy for our customers. Further, we offer the highest degree of customer service, care, and attention in the industry. We take pride in the quality, durability, and reliability of our safes. Since we believe your choice of a Cannon safe is a permanent one, we’re proud to offer lifetime protection for your investment to give you peace of mind. So what does lifetime protection mean for you as a customer? If any of these unfortunate events occur Cannon will repair or replace any defective or damaged part or replace the safe completely, as long as the proper documentation is provided and the safe is registered. Whenever possible, the safe will be repaired locally. If your Cannon safe needs to be replaced, we’ll simply require the old safe to be returned to the factory at our expense. If you purchase a Cannon safe, your lifetime protection policy will give you peace of mind that your investment is well-protected against defects, break-ins, and natural flood and fire. At Cannon Safe, we’re proud to honor our customers with this lifetime protection policy, because we truly care about our customers before, during, and after the purchase of a Cannon safe. 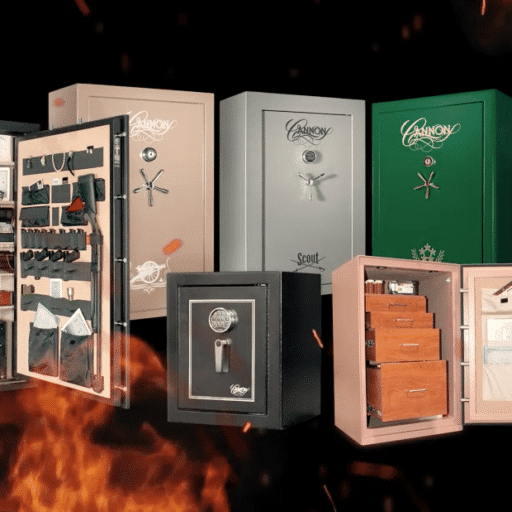 Pentagon Safe offers the best lifetime warranty in the gun safe industry. We appreciate your trust in our safes. That’s why we offer a lifetime warranty that covers everything. The Safe, the lock and even fire! We also offer a customer service team that’s available 7 days a week. We take pride in our products and hope this warranty provides you with the piece of mind you’re looking for. Defects in workmanship, locks and interiors. Damage from an attempted break-in or even actual break in. Fire warranty – This means if you go through a fire we will give you a free safe. Customer is responsible for picking up safe or delivery of safe. If your Pentagon Safe is damaged or defective we will repair or replace the safe. The safe will be fixed at the customer’s home, a locally safe repair shop or shipped back to one of Pentagon Safes locations and a new safe will be redelivered to customer free of charge. The defective safe will be shipped back to our plant free of charge to the customer. When you buy a Pentagon Safe, you’re covered for life. If you have more questions, please contact us directly – 800 266 7150. We look forward to serving you.